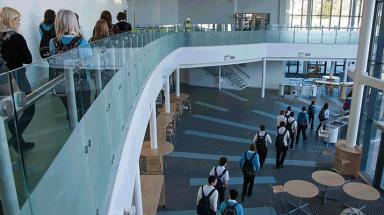 Pupils moved into the new Elgin Academy for the first time on Wednesday. Over 600 pupils moved into their new school on Wednesday as Elgin Academy opened its doors for the first time. The new secondary school, the first to open in Moray in 35 years, cost £30million and took almost two years to build. It replaces a building that was itself declared as state-of-the-art when it opened in the 1960s. Elgin Academy is now future-proofed in that it can deal with an expanded role of up to 1000 pupils who will enjoy a new games hall, performance stage, drama, dance and musical studios and indoor/outdoor fitness areas. Pupils were given an extra four days holiday on their Easter term break with two days before the holiday allocated for moving retained fittings from the old school and two days at the start of this week to allow staff to prepare the new school for pupils. Ahead of the move the school’s head teacher, David Barnett, said: “This undoubtedly provided us with a huge challenge that Elgin Academy staff have risen to meet. One of the school’s pupils is STV Local photography contributor Chris Milne, who said: “I could not help but think that the school looked more like a block of offices as everything was so similar and really did not feel much like a school at all. Parents driving their children to the new school have been asked to take special care to ensure they use the correct drop-off procedures and be aware of what will be for a time strange surroundings.